Flambé is my latest obsession. It all started this Christmas when I reinvented my traditional Bûche de Noël by making a Baked Alaska inspired Bûche de Noël. It was even a better throw back to the originations of the Yule log. than my traditional cake. Plus it is super fun to light your dessert on fire! After warming your high proof liquor in a sauce pan, fill your ladle, light it on fire and pour over your dessert. In search of another dessert that would be perfect to flambé my mind turned to another recent obsession of mine: pavlova. I knew poached pears were often served flambé so I decided that a pavlova with light swirls of brown sugar, topped with a vanilla and brown sugar whipped cream and poached pears would combine to form the perfect dessert to start on fire. Remember to like my video and subscribe to my channel so you don’t miss any of my tutorials! Begin by separating your 4 room temperature eggs. Meringue can be tricky if you don’t know what you are doing. But that is exactly why I have 4 tips for making the perfect meringue every time. Meringue Tip #1: Always use room temperature eggs. If you forgot to get your eggs out of the refrigerator in time, simply place them in a bowl of warm water for 10-15 minutes. Meringue Tip #2: Make sure that none of your egg yoke gets into your meringue. Egg whites are primarily water with about 10% protein and their ability to foam and eventually stiffen (with the addition of sugar) into meringue is due to the way the water molecules and amino acid molecules interact when whipped. Any fat present, like your yokes, interferes with the water and protein inhibiting your ability to whip your whites into a meringue. This is the same reason why it is important to alway use a glass or metal bowl when making meringue. Meringue Tip #3: Always use a glass or metal bowl. No matter how well you wash your plastic bowls, they often retain grease and fat residue. Make sure your bowls and whisks are clean and dry and you are well on your way to the perfect meringue. Now we are ready to start whisking our egg whites into meringue. Add a pinch of salt to your egg whites and beat them on medium speed until they are frothy. Now you can begin adding your sugar. Meringue Tip #4: Add your sugar very slowly. While beating on high speed, I add one spoonful off sugar at a time and I count to 30 in my head before I add another spoonful. This is where I most often fail at my meringue. Don’t be impatient! Beat until you have nice stiff peaks. See the peaks on that meringue?? Meringue for a pavlova is different than the kind you would make for a cookie in that it also contains cornstarch and vinegar. The cornstarch helps to protect your pavlova from over baking and the acidity in the white wine vinegar stabilize your meringue. But combined they do something magical and make a pavlova with the perfect crunchy shell and marshmallow interior. It has to be magic. Now you are ready to spoon your pavlova onto a baking sheet. The easiest way to make a perfect pavlova circle is to trace a bowl on parchment paper, flip it upside down (so that you don’t bak your meringue adjacent to ink), and then spoon your meringue within the circle. Then put it in the oven that is preheated to 350 degrees and bake for about 1 hour. When your meringue is done, leave it in the oven to completely cool and dry out. I am serious. DO NOT OPEN THE OVEN DOOR. When I have the time, I actually always bake mine the night before so it can sit in the oven to dry out over night. Now it is time for your poached pears. After you have peeled your pear and set them aside in water to start softening up, you can get your poaching liquid boiling. Add the rest of the ingredients to a large stock pan and bring it to a boil. Add your pears ( I did mine whole!) and reduce your heat a little. Let your pears cook for 10-15 minutes. You will know they are done when you can pierce them with a skewer or fork and they are easily skewered but don’t fall apart. Remove your pears and set them aside to cool. 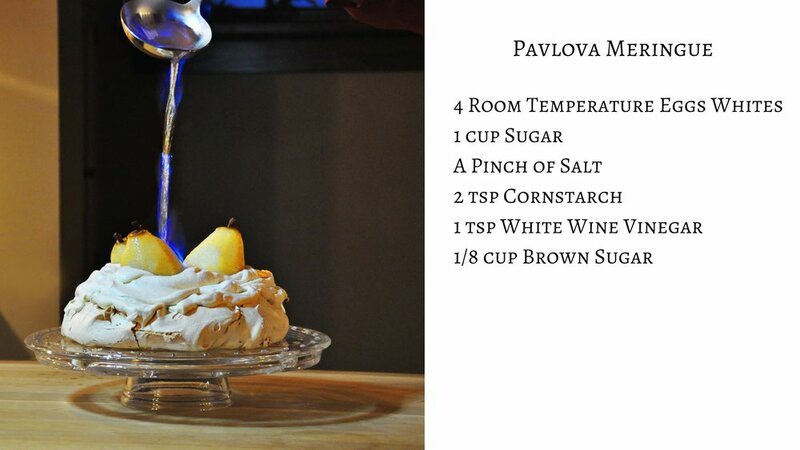 While your pears are cooling, you can make your whipped cream! Add your whipped cream to your meringue. 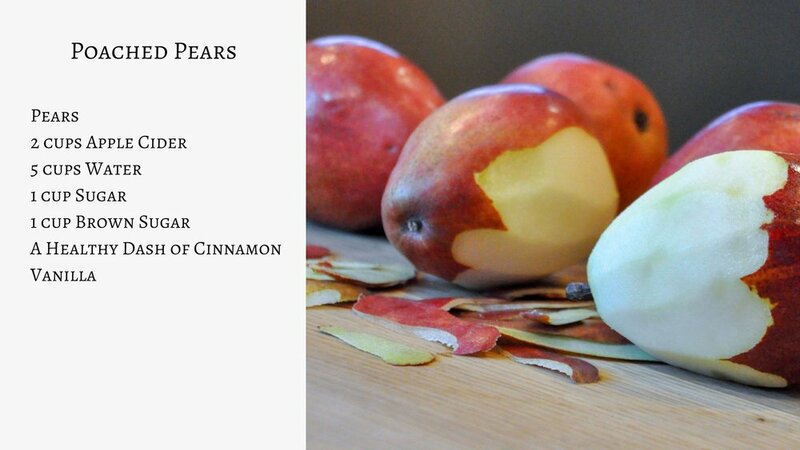 Now it is time to add your poached pears! Ready to light it on fire? 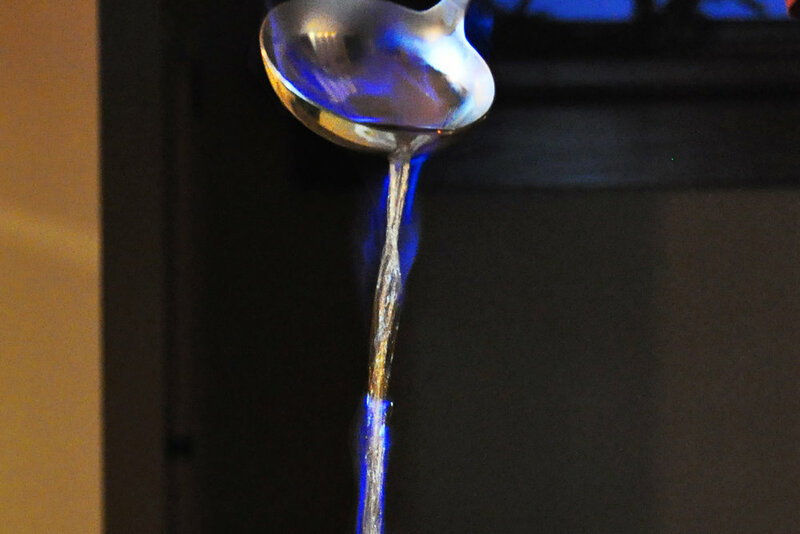 To flambé your dessert, start by heating up 1/4 cup of a high proof alcohol. DO NOT LET IT BOIL. If it boils you will have burned all of the alcohol off and you will not be able to get it started on fire. I used Captain Morgan 100 because I had it on hand. Then take a ladle filled with the warmed alcohol, start it on fire and pour it over your pavlova. And now you have officially impressed all of your guest…or scared them.